I have finished my pumpkins but made them Jack-O-Lanterns. My kids thought they should have faces. I kind of thought they were cute before I put on the faces. They will be ready for using this weekend for Canadian Thanksgivings. 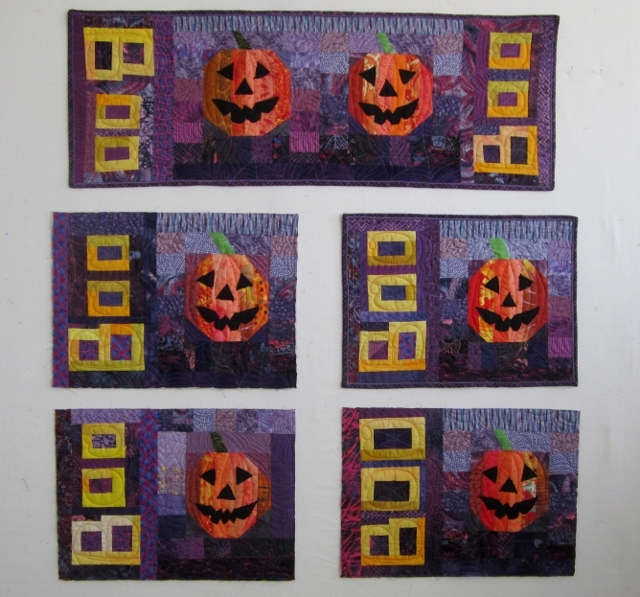 When I started this last Saturday, I made six pumpkins, thinking I would make 6 mats. Then I thought maybe a runner would be nice too. We are a family of four, so four mats and one runner. The runner is totally done. This mat is totally done. The other three mats still need binding. I will finish the other three tonight. 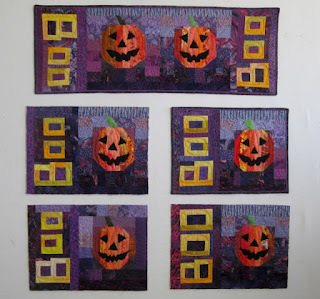 If you want to know more about the piecing and how I did it please check my post Wednesday Pumpkin Mats How To. 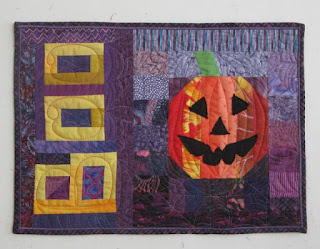 And big thanks you to Vicky Welsh at Field Trips in Fiber, She has put a link in her newsletter to the tutorial. I sewed the binding on with a zigzag stitch. I was not going to hand stitch and I am really rotten at the normal machine stitch the binding back. I have trouble getting the back caught. I think my problem is my bindings are tight, even to hand stitch ( mom complains about mine when I get her to hand stitch the bindings). I machine quilting in many many spider webs into the background. The black faces are stitched with a ruff edge applique. OK I am being a link up junky this week. But there is so much to see on Fridays. It takes me all weekend to check them all out. So, so cute! Well done. 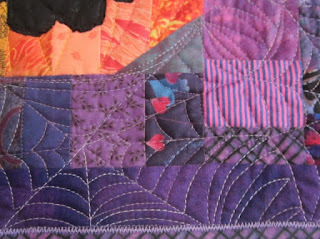 And I love the spider web quilting! They are fantastic! I really hope I have some time to make some of these. I have a big Oct 16 deadline but maybe after that. You put me to shame! I still have not completed mine. 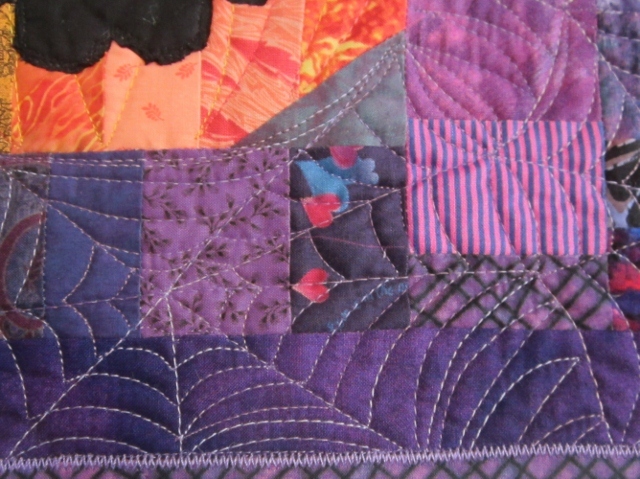 I LOVE how they all came out and the spiderweb quilting is so cute! Hmmm... I do love the jack o lantern faces. Decisions, decisions... I may have to modify mine =). Happy early Thanksgiving. Really lovely Cathy_ I hope you and yours have a wonderful Thanksgiving. I think perhaps I will put some fall decorations out to make it look a bit like autumn. Just another way for machine binding a quilt- you may be familiar with it already. I machine sew all my bindings _ I apply them to the back of the quilt and then use a blind hem stitch to the front. It probably is not as pretty as hand stitching it but it works pretty well. So cute! What an adorable collection. Done just in time for fall. the mats and runner are just adorable you did a great job and I love the spider web quilting too. Very cute! 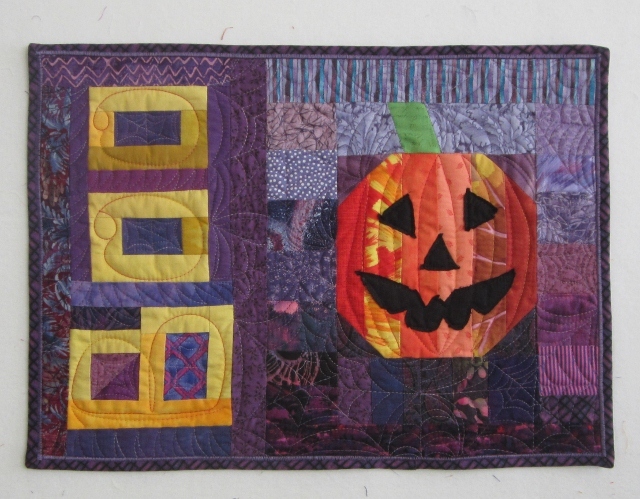 Love all the purple with the pumpkins. The color hues are excellent in this!! I like all those spider webs so cool! So cute, Cathy, and how wonderful to have them done in time for the holiday!!! Whoop whoop!! SUPER cute table runner and placemats! 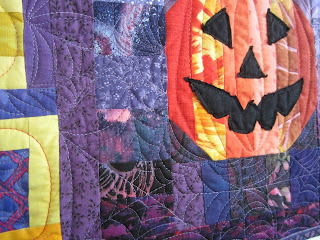 I have a pumpkin placemat on the go for my daughter - your spiderwebs are absolutely inspiring! I hope you had a wonderful Thanksgiving. Thanks for linking up to Friday Felicities!